For over two years, I talked about increasing my meditation practice. Since moving to Spokane I have had a stable morning practice, but could not bring myself to settle into a habit of meditating in the evening. 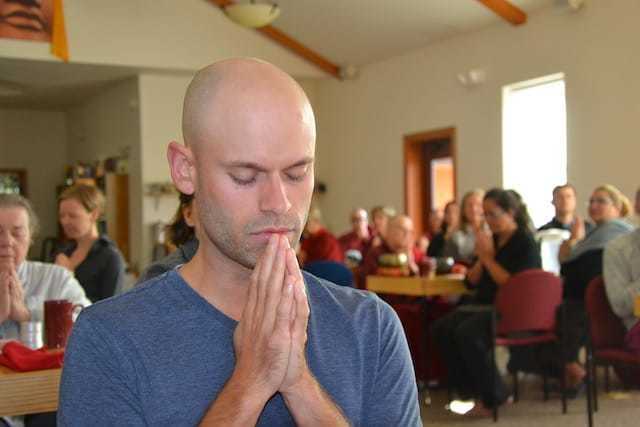 One day while speaking to a Dharma friend, I thought, “What if I just do 5 minutes every evening for a week and then if I’m still doing it, increase by 5 minutes for the following week?” We agreed to check-in on one another the next week. He had wanted to begin a morning practice, so we would check-in to encourage and support one another. Take the tiniest step and make your way! It’s been about two months since beginning my evening meditation sessions and I am still on track. I’m meditating 30 minutes every evening or afternoon. My friend and I are still sending weekly update texts, and I feel encouraged and inspired. What I learned about myself is this: stay somewhat comfortable and especially stay happy. It seems calling, “joyous effort,” “enjoyable effort,” would be a helpful mantra to remember. I am slowly learning how to encourage myself gently without pushing too hard. “Taking the tiniest step” does two things. First, it’s an action in the direction I want to go, so it can fill my mind with hope, optimism, and confidence. Second, the action is small enough to be easy. This is really the key. If I expect myself to take a huge leap, while I may initially be able to do it, it will be difficult or impossible to sustain. I must gently and kindly encourage myself to do more and more virtue. I would like to apply this strategy to many other areas of my life including my relationship with technology, the type of media I consume and my habit of multi-tasking. However, as I learned, these changes must be approached slowly in order to take hold. One tiny step at a time, I am changing and that is good enough.